I had no idea what that meant as a kid, and I kind of still don’t, but I always thought it was so cool. I’m a beer guy now, but wouldn’t it be cool to have your own drink? I mean, that was his thing. He had a lot more awesome things too, but it was just part of his charm. Ordering a drink, his own drink, and doing it the same way — there was something really cool about it. He also used to always do this thing where he’d ask the waitress if she cooked the meal, because it was so good. He was funny. This weekend, when we went to Detroit and stayed at Shana’s, she had her liquor front and center. And when it came time for us to settle in for the night, she was quick to pour us a drink. I have no idea what it was called, but it was made with St. Germain, Elderflower vodka, and Limonata … and it was amazing. 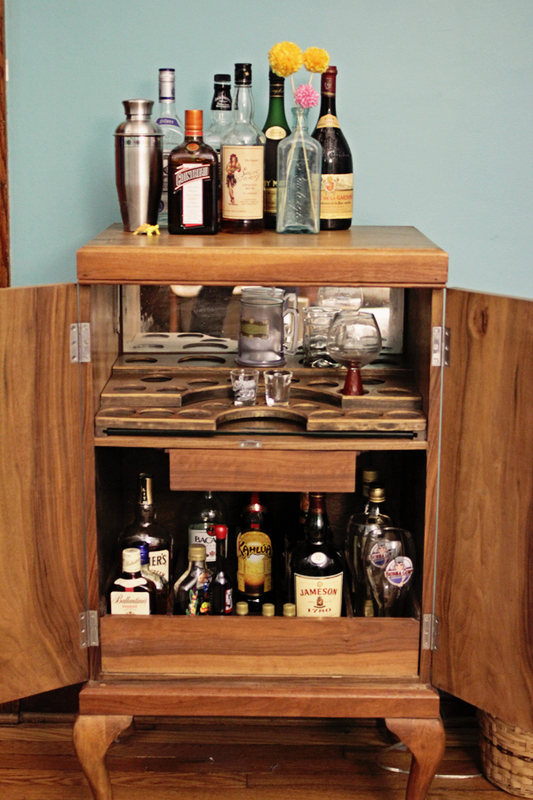 We have this awesome liquor cabinet that usually sits in a room we are never in. 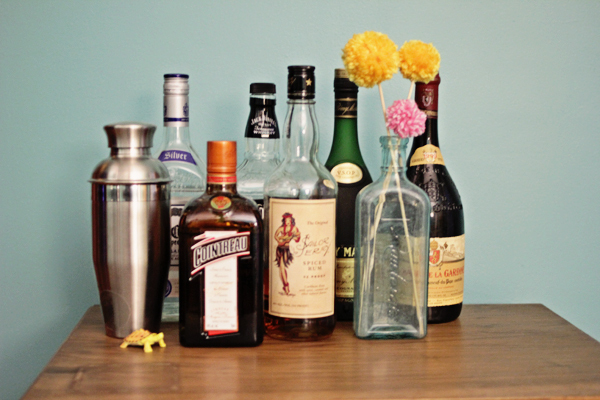 We’re not huge drinkers, but the cabinet is fun and, now we know, great for entertaining. 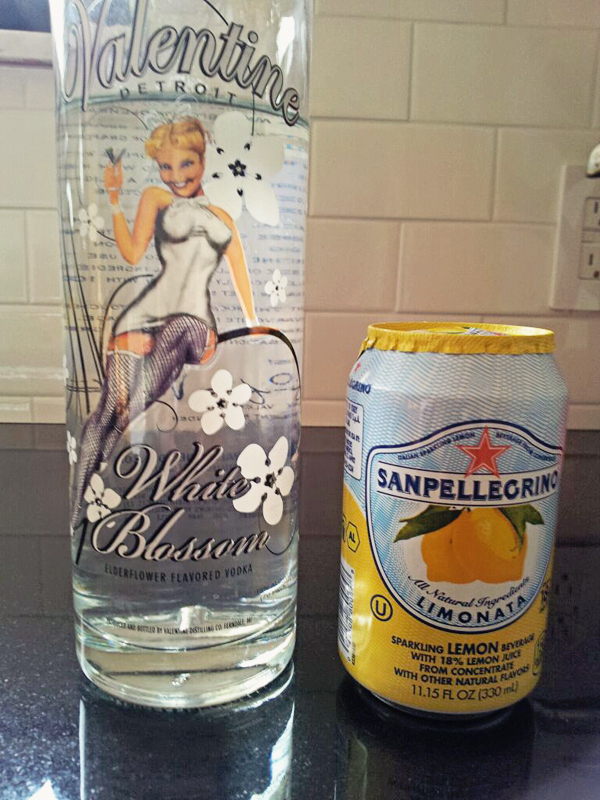 And I sure wouldn’t mind pouring myself whatever that Elderflower drink was. Or creating my own version of some classic cocktail. We’ve still got a ways to go before we can make this liquor cabinet live up to it’s fun potential. A few years ago we started collecting “funny” glasses to have in there. We love the idea of taking something traditional and putting something modern and unexpected in it… but really, Bubba Gump Shrimp Co. glasses aren’t really as funny in this thing as we thought at the time. In addition to that, we have no idea what most of the liquor in here is. There’s quite a few bottles of Scotch, though. Regardless, in about two hours, we had done lots of moving of furniture (which I’m sure will be documented in future posts), but one of the most important parts is that we moved our liquor cabinet into our Rumpus room. We did some quick decorating with the nicer looking bottles on top, and now we are ready to entertain at the drop of a hat.